The ingredient Fire Salts is collected from dead Flame Atronachs. Three samples of Fire Salts are necessary to activate the Atronach Altar in the Wizard's Tower official plug-in, if you wish to use the altar to summon a permanent Flame Atronach companion. (Frost Salts or Void Salts will instead provide a Frost Atronach or Storm Atronach, respectively). It can also be found randomly in the inventories of alchemy vendors (starting at level 9) and in some Conjurer and Oblivion loot chests (starting at level 7). Standard Flame Atronachs (and not summoned ones) are the only source of this ingredient. They are commonly encountered in Planes of Oblivion at levels 9 through 17. 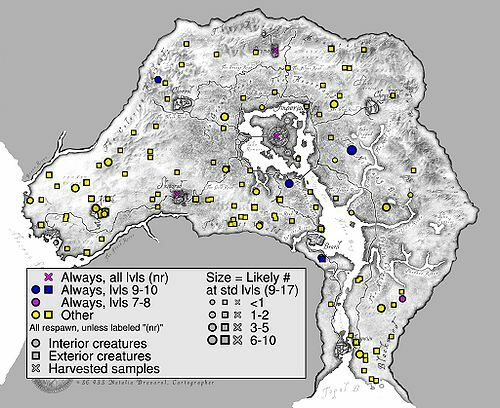 As with other daedric creatures, in Tamriel the best places to look for Flame Atronachs are in Conjurer Dungeons (circles on map), where they may spawn at levels 9 through 17, and outside Oblivion Gates (squares on map), where they may appear at level 10-19. Trying to find Flame Atronachs before level 9 or after level 17 is challenging. They are primarily restricted to some locations specific to the Main Quest. The daedra that spawn outside of Oblivion Gates each have a 25-50% chance of being Flame Atronachs at levels 10-19. These gates are the best source of Flame Atronachs at levels 18 and 19. In the Count's Chamber in Castle Kvatch (during the quest The Battle for Castle Kvatch), there is one daedra who has a 50% chance of being a Flame Atronach at levels 4 and higher. Elsewhere inside Castle Kvatch, there are 10 daedra who each have a 50% chance of being a Flame Atronach at levels 5 and higher. These 10 daedra and the aforementioned daedra in the Count's Chamber are the only places above level 19 where Flame Atronachs will ever appear. The caves in Mankar Camoran's Paradise (during the quest Paradise) contain 12 daedra who each have a 22-33% chance of being a Flame Atronach at levels 5-15. The Eternal Gardens in Paradise contain 8-14 daedra who each have a 20-33% chance of being a Flame Atronach at levels 5-14. 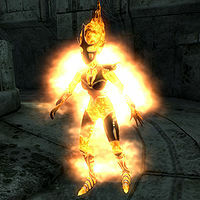 The daedra spawned during the Defense of Bruma quest each have a 33-50% chance of being a Flame Atronach at levels 6-14. Fort Teleman (purple circle) is guaranteed to have a single Flame Atronach (the boss-level Daedra) at levels 7 and 8. 3 are likely at levels 9 or higher. Arkved's Tower, Fathis Aren's Tower, Fort Rayles and Sardavar Leed (blue circles/squares) are each guaranteed to have a single Flame Atronach at levels 9 and 10. They may also have additional Flame Atronach at levels 9 or higher.